Mother Nature made her presence known at the opening round of the 2013 Mtn. Dew ATV Motocross National Championship, sanctioned by AMA, in Washington, Ga. on Saturday. With less than perfect conditions, twenty-three pro riders lined up at the muddy Aonia Pass MX track, creating a full gate for the first time in recent history. Defending champion Chad Wienen rode smart and collected to grab the first victory of 2013, due in part to his knowledge gained from earning the number one plate in 2012. Wienen scored a 3-2 finish to secure the overall win aboard his Wienen Motorsports SSi Walsh Yamaha presented by Maxxis Tires & Team Vollmer machine. Wienen was able to secure top five starts, allowing him to move into a favorable position to take the overall win. "I'm happy with the outcome. Anything is possible with a mud race but I'm really excited to be leaving still carrying the red number plate," said Wienen. Josh Upperman snagged the moto one SSi Decals Holeshot Award aboard his Baldwin Motorsports PEP Upperman Racing machine in moto one. Wienen Motorsports SSi Walsh Yamaha presented by Maxxis Tires & Team Vollmer's Thomas Brown made a quick pass into the lead but Hetrick came charging through the pack early on. Hetrick took over the first place position and never looked back, laying down consistent lap times throughout the entire moto. Meanwhile, Brown's teammate Wienen made his way into third and rode a smooth and comfortable pace, unable to close the gap on the leaders. Upperman settled into fourth and remained there for the rest of the race with a comfortable gap between him and the rest of the pack. JB Racing Cheerwine Can-Am's Jeffrey Rastrelli finished a career-best fifth place in moto one. After getting tangled up in the first turn pile up, Rastrelli put his new Can-Am ride to the test and was able to make his way up to the fifth place spot. "I'm really proud of my moto one finish, I've only had three days of riding on my new machine and am really liking the way it handles. I was able to make passes through the field when I needed to in order to secure a fifth place finish," said Rastrelli. Veterans John Natalie and Josh Creamer were also involved in the first turn pile up, leaving both championship contenders at the back of the field. The highly anticipated return of 2010 champ Josh Creamer had fans on edge as he worked his way through the field making most of his passes through the roller section. Creamer was able to salvage a sixth place finish after being forced to play catch up throughout the race. Creamer came out swinging in moto two, grabbing the SSi Decals Holeshot Award before taking the early lead and never looking back. "I knew I had to get a better start than moto one and my BCS Can-Am came out on fire. I was able to get great traction with my ITP tires, we have done a lot of tire testing in the off season and really have this machine hooked up really well," said moto two winner Creamer. Upperman, Hetrick and Wienen had a heated battle for the second place position during the first half of the race. Wienen came out in fourth and pressured Hetrick until lap four when he made the move through the rollers upon a mistake by Hetrick. Hetrick kept on Wienen for a few laps but was unable to make Wienen crack under pressure. Then setting his sights on Upperman, Wienen charged the field and made the pass right before heading into the rollers at the ten-minute mark and charged forward for a second place finish. Upperman and Hetrick continued their battle throughout the entire race keeping the fans on the edge. Upperman held his lines solid and Hetrick was unable to make a pass. On the last lap of the moto, Upperman spun out with a few turns to go and Hetrick ran into the back of the number 20 machine, leaving him stranded in the track unable to restart his machine. Upperman went on to secure a fourth place finish in moto two and Hetrick was left mid-pack finishing in eleventh place. "I wasn't too happy about my moto two finish but I was able to save moto two and come out with decent points. 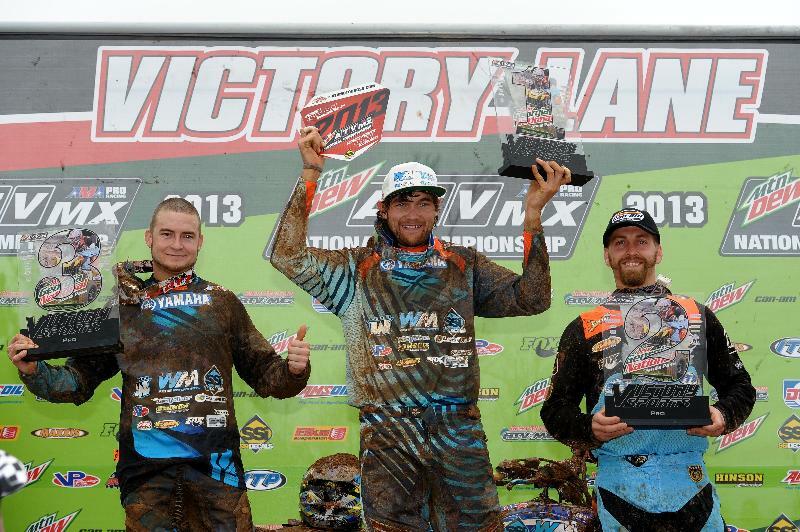 I rode hard in moto two and luck just wasn't on my side," said Hetrick. Brown came out of the first turn in fifth, right behind the battle for second and made a few mistakes early on. Brown was able to put his head down and make his way back up to the front of the pack, making the pass into fourth on the last lap. "I'm pumped to start the season off on the box with solid points!" said Brown. Rastrelli looked as if he was going to come out of moto two with a similar finish to moto one, however, things didn't quite go as planned for the Florida native. Rastrelli grabbed a mid-pack start and was able to maintain a seventh place position until two laps to go he went up over a berm and couldn't get his machine out of the mud. Cody Suggs of Suggs Racing finished tenth place overall after two solid tenth place finishes. Suggs' tenth place overall made him the highest placing rookie of the day. "I came into the weekend looking for a top ten finish and I achieved my goal. I'm looking forward to this year and improving as the season progresses," said Suggs. 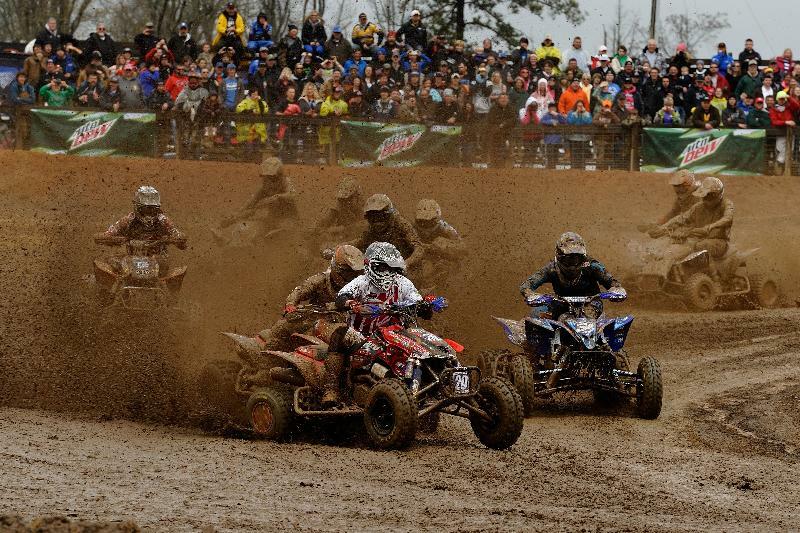 The 2013 ATV Motocross National Championship Series continues April 13 and 14 in Blountville, Tenn. for Round 2 of racing at Muddy Creek Raceway. For more information, please visit www.atvmotocross.com.